Scan Here: Interactive online edition with more photos. 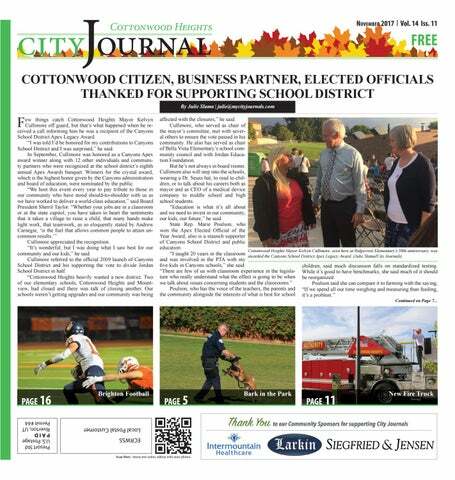 Brighton High’s new peer leadership team honors local ﬁre, police departments By Julie Slama | julie@mycityjournals.com The Cottonwood-Holladay City Journal is a monthly publication distributed directly to residents via the USPS as well as locations throughout Cottonwood and Holladay. For information about distribution please email circulation@mycityjournals.com or call our ofﬁces. Rack locations are also available on our website. For subscriptions please contact: circulation@mycityjournals.com The views and opinions expressed in display advertisements do not necessarily reﬂect or represent the views and opinions held by Loyal Perch Media or the City Journals. This publication may not be reproduced in whole or in part without the express written consent of the owner. hen Tom Sherwood became principal of Brighton High this summer, one of the ﬁrst things he did was approach Brighton teacher April Ball to begin a peer leadership team. “When he asked if I wanted to teach it, he piqued my interest saying we provide service to the community,” Ball said. “I teach English and I wanted to advise this, give our students a chance to be in a different environment and help the community.” At local high schools, the peer leadership team (PLT) devotes time and energy to promote a drug-, alcohol- and violence-free environment for the school and the community. The teams traditionally visit local elementary schools presenting the peer refusal skills to students through skits and songs, demonstrating bad situations such as cheating, stealing, lying, bullying, vandalizing and using drugs. Ball, who has a ﬁfth-grader, asked her child to tell her about the recent high school’s PLT visit. “My kid liked it and said the high-schoolers taught them a lot of skills that they could use,” she said. 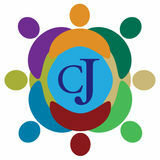 CitY JourNal is a Free PubliCatioN made Possible bY our advertisers . Please sHoP loCal aNd let tHem KNow You saw tHem iN tHe CitY JourNal. **Coupon must be presented at first appointment. Cleaning is in absence of gum disease. Patients with insurance - we will accept your insurance benefits. Subject to insurance restrictions; cannot be applied to insurance co-payments. Holladay Family Dental is solely responsible for all gift fullfillment upon valid completion of all Program Requirements. Regular value of $3,154. Back row left to right: Gabrielle Marz, Adrian Pozernick, Raegan Davenport, Darienne DeBrule, Melise Zundel, Bryn Jorgensen, Rori Phibbs. Front row left to right: McKenzie Gutierrez, Sarah Ellis, Lauren Webb, Anna Kaufman, Rebecca Dawes, Bethany Cutler. Now Accepting New Patients Olympus Family Medicine is pleased to introduce Dr. Matthew C. Hansen. He is Board Certified in Internal Medicine and has been in medical practice in Utah since 1998. He specializes in caring for patients with multiple medical problems. He has expertise in diabetes management, cardiovascular disease, dermatologic disorders and musculoskeletal conditions. He also has advanced training in aesthetic medical procedures. Dr. Hansen was born in Idaho and raised in Missouri. He moved to Salt Lake City, Utah in 1995 to complete his residency at the University of Utah in Internal Medicine. Dr. Hansen is married with 4 children, 3 sons and a daughter. He enjoys spending time with his family at Bear Lake. He is also an avid snowboarder and also trains in Krav Maga. We now accept Select Value and University of Utah insurance plans! LIMITED TIME! Mention offer code FreeEchoDot Requires internet-connected Hopper® or Wally® and Echo, Echo Dot or Amazon Tap device. “I think that’s where we are. Perhaps we’ve gone overboard. We look at SAGE standardized testing, school grades, high school juniors testing in English and so many more. We don’t always recognize what is going on in the classrooms, how teachers are helping our students grow. I know. I’ve been there. We need to streamline it,” she said. Poulson also said she hasn’t stepped far away from schools. She still returns to talk to Canyons students about serving in the house at the state capitol as well as give tours. “This award is really meaningful as I’ve worked so many years with children and it comes from other educators,” she said. Working in the schools is at the heart of Rayna Drago’s service, who won the Canyons Volunteer of the Year Award. As a two-year PTA president at Canyon View Elementary, Drago is often found volunteering, fundraising, tutoring and mentoring — serving just about wherever she sees a need. She said her focus is to brighten a child’s day, but she also wants to give those around her a boost. For example, Drago had just sent out an email with a silly joke when she received a call from the district. “I thought, ‘oh no, someone didn’t like the silly comment I put in,’ and so I thought I was in trouble,” she said. Instead, the call was to tell her that she would be receiving the Apex Award. “It was overwhelming and totally unexpected,” she said, adding that when former Canyon View principal BJ Weller surprised her with balloons at recess, she was instantly surrounded by students cheering. “Everyone said I lived at the school for those two years and I just took it to a new level. They knew if there was a job to be done, I’d get it done,” she said. Drago said simple things like a movie night, having a dude lunch for students and their dads, grandfathers and other male role models or posting photos of the principal and having kids search for “Where’s Weller” brought smiles to the students. “I just looked for fun things, new events and activities for the students to make a difference in their lives,” she said. Impacting students’ lives is what RizePoint’s goal has been for the past two years, said its CEO Frank Maylett. RizePoint, a Cottonwood Heights-based software company, was awarded the Business Partner of the Year. “I was in a meeting when our chief marketing staff member came in and said, ‘I’m happily interrupting’ and told us about the award. I’m pragmatic. I thought, ‘Why us? We haven’t done enough. There’s more we can do,’” he said. However, RizePoint has donated $5,000 to the Canyons Education Foundation to provide scholarships for students to attend STEM camps so about 20 students each summer can learn about space, computer science, engineering, marine science and more. “We want to expand that so more students can beneﬁt,” he said. If you are thinking about buying or selling your property, please allow me to share my experience with you when you are looking for a place to call home. ver the past few months, Accessory Dwelling Units (ADUs) have been a hot topic of conversation for city leaders and residents within Cottonwood Heights. Commonly referred to as mother-in-law apartments, ADUs are currently not under any code within the city. As city staff members attempt to draft an ordinance concerning these living spaces, much feedback has been received. Accessory Dwelling Units are currently deﬁned as a “residential dwelling unit meant for one additional single family located on the same lot as a single-family home, either within the same building…or in a detached building.” The issue There is no code for Cottonwood Heights that addresses ADUs. For that reason, every ADU within the city is technically considered illegal. That includes the creation and operation of such living spaces. “This has been brewing for years,” Mayor Kelvyn Cullimore said. “The problem is that these ADUs are illegal; any type of basement apartment is illegal in the city.” “Hundreds of these already exist,” Councilman Mike Shelton said during a weekly city council meeting. The approval process for ADUs “must be designed to conform with all current codes.” “I hate a system that favors people who are willing to break the law,” Shelton continued. “That’s what we have right now.” With the creation of an ADU ordinance, the existing ADUs should be able to come into compliance. For an ADU approval, the applicant would need to meet certain requirements, which would include a building inspection. Timeline City staff members originally began to look at drafting an ADU ordinance earlier this year. On July 11, staff members reported to the Cottonwood Heights City Council that they had begun work on the ordinance. By July 18, an ADU ordinance was still being drafted to help existing ADUs “come into compliance within a few year’s period of time,” Senior Planner Mike Johnson said. On August 2, the Cottonwood Heights Planning Commission conversed on the topic as it was listed as a discussion item on the meeting agenda. They discussed the pending ordinance regarding the permitting and regulation of ADUs. On Sept. 6, an initial public hearing was held. Throughout the rest of September and October, much public comment was centered on this issue during city council meetings, planning commission meetings and through email. Currently, public input is still being sought. Feedback Many residents have voiced concern about the drafted ordinance. Some of the common concerns include enforcement (if the code is enforced to the fullest extent, families may be displaced), parking, affordable housing, densiﬁcation and public safety. Resident Nancy Hardy had some questions for the city council to take into consideration on Aug. 22. “How does the city beneﬁt from the ADU? How do you keep the zones as single family zones? Does the ADU ﬁt into the general plan and vision of Cottonwood Heights and how will it be enforced?” “Neighborhoods could double in density,” Hardy continued. “Would there be a limit on how many ADUs could be in the city and how many people could live in each? What is the required percentage of affordable housing and what dollar is considered affordable housing for Cottonwood Heights?” On Sept. 12, Hardy commented to the council once more. “ADUs are like any other kind of densifying development, but they are subtle. A few will be built in neighborhoods each year and each ADU changes the neighborhood just a little bit. They will not instantly change a city but the effects are long term.” Resident Teven Grace had some questions as well. “How does this serve to enrich and sustain this community? We should not be responsible for those who can’t afford to live here. This city is intended for quiet suburban living, rather than conversion of single family homes to multi-family homes.” Resident Jen Fredrickson echoed these comments. “I don’t see how this is going to help our community.” The draft While continually drafting an ADU ordinance, city staff members including Johnson and Community and Economic Development Director Brian Berndt have taken resident feedback into consideration. One of the results of this meeting was a request for the chiefs around the valley. They hope to have a data set of coded reports that deal with people from the Rio Grande. “It really needs to be at the chief’s level because it’s an important topic,” Russo said. LarkinMortuary.com CitY JourNal is a Free PubliCatioN made Possible bY our advertisers . Please sHoP loCal aNd let tHem KNow You saw tHem iN tHe CitY JourNal. CHOICE ™ All-Included Package MO. Plus taxes. For 12 months w/ 24-mo. TV agmt. $115/mo. in months 13-24 (subject to change). Regional Sports fee up to $7.29/mo. is extra and applies in certain markets. 2017 2017 NFL NFL SUNDAY SUNDAY TICKET TICKET INCLUDED INCLUDED AT AT NO NO EXTRA EXTRA COST COST WHEN WHEN YOU YOU SWITCH SWITCH TO TO DIRECTV. DIRECTV. With CHOICETM All-Included Package and above. Subscription renews automatically each season at then-prevailing rate (currently $281.94/ season) unless you call to cancel prior to the start of the season. Req’s you to select offer. ALL DIRECTV OFFERS REQUIRE 24-MO. TV AGREEMENT. EARLY TERMINATION FEE OF $20/MO. FOR EACH MONTH REMAINING ON AGMT, $35 ACTIVATION, EQUIPMENT NON-RETURN & ADD’L FEES APPLY. New approved residential customers only (equipment lease req’d). Credit card req’d (except MA & PA). $60 1-YR CHOICE ALL-INCLUDED PACKAGE PRICE: Ends 11/04/17. Available only in the U.S. (excludes Puerto Rico and U.S.V.I.). Price includes CHOICE All-Included TV Pkg, monthly fees for a Genie HD DVR + (3) add’l receivers, and standard prof’l installation in up to four rooms. Custom installation extra. After 12 mos. or loss of eligibility, then-prevailing rate for TV package applies (currently $115/mo. for CHOICE All-Included) unless canceled or changed by customer prior to end of the promotional period. Exclusions: Price does not include taxes, $35 activation fee, Regional Sports fee of up to $7.29/mo. (which is extra & applies in select markets to CHOICE and/or MÁS ULTRA and higher pkgs), applicable use tax expense surcharge on retail value of installation, equipment upgrades/add-ons, and certain other add’l fees & chrgs. DIRECTV SVC TERMS: Subject to Equipment Lease & Customer Agreements. Must maintain a min. base TV pkg of $29.99/mo. Programming, pricing, terms and conditions subject to change at any time. Visit directv.com/legal or call for details. 2017 NFL SUNDAY TICKET OFFER: Package consists of all live out-of-market NFL games (based on customer’s service address) broadcast on FOX and CBS. However, games broadcast by your local FOX or CBS affiliate, and select international games, will not be available in NFL SUNDAY TICKET. Games available via remote viewing based on device location. Other conditions apply. 2017 NFL SUNDAY TICKET regular full-season retail price is $281.94. 2017 NFL SUNDAY TICKET MAX regular full-season retail price is $377.94. Customers activating CHOICE or MÁS ULTRA Pkg or above will be eligible to receive the 2017 season of NFL SUNDAY TICKET at no add’l cost and will receive a free upgrade to NFL SUNDAY TICKET MAX for the 2017 season. Your NFL SUNDAY TICKET subscription will renew automatically each season at the then-prevailing rate (currently $281.94/season) unless you call to change or cancel by the date specified in your renewal notice. Up until the season starts, you can cancel anytime and receive any applicable refund. To renew NFL SUNDAY TICKET MAX, customer must call to upgrade after the 2017 season. Subscription cannot be canceled (in part or in whole) after the start of the season and subscription free cannot be refunded. To access DIRECTV HD programming, HD equipment req’d. Add fees may apply. Games available via remote viewing based on device location. Only one game may be accessed remotely at any given time. NFL, the NFL Shield design and the NFL SUNDAY TICKET name and logo are registered trademarks of the NFL and its affiliates. ©2017 AT&T Intellectual Property. All Rights Reserved. AT&T, Globe logo, DIRECTV, and all other DIRECTV marks contained herein are trademarks of AT&T Intellectual Property and/or AT&T affiliated companies. All other marks are the property of their respective owners. 18 Month Treatment. Expires 12/31/17. f all the regions in Utah high school girls soccer, Region 7 is among the most challenging. The Brighton Bengals are well aware of this. Brighton ﬁnished its regular season with a 5-4-1 region record, good enough for third-place tie with rival Alta. The Bengals were 11-4-1 overall heading into the postseason. In their two regular-season games with Alta, the Bengals suffered a 2-1 loss on Sept. 7 and played to a scoreless draw in the regular season ﬁnale Oct. 3. As a result, Alta won the tie-breaker to secure the No. 3 seed in the Class 5A state tournament. As the fourth seed, Brighton drew Region 5 champion Woods Cross in an Oct.
FREE Facial, Massage, OR IV With Treatment WITH THIS AD. Expires 12/31/17. ton scored 14 points in the ﬁrst, second and fourth quarters, along with seven in the third. Quarterback Alexander Zettler scampered for 112 yards and a touchdown (a 55-yarder) on just seven carries. He also threw for 67 yards and a pair of touchdowns. MJ Cirillo brought a Cottonwood punt back 75 yards for a touchdown. Bullett pointed out that the team suffered some key injuries and were forced to play some younger players. This made the task even more daunting against some of Class 5A’s best teams. “We need to develop more depth, so when we have kids get injuries, the drop-off is not so dramatic when we go to the No. 2 players,” he said. Despite a rough region season, Bullett and his players maintained a positive outlook and continued to work hard. “The kids have a great attitude and were trying to get better as we went through a very tough region schedule,” Bullett said. Bullett praised the play of sophomore middle linebacker Sione Angilau, who led the team in tackles. He also saw time at running back and rushed for 110 yards and two touchdowns. He, along with sophomore Kepu Fiﬁta and junior Vona Hall, all return next year in the Bengals’ backﬁeld. Trey Davenport carries the ball for Brighton in a victory over Cottonwood. our already low prices Expires 12/23/17. Used Jr Ski $Starting at Packages 100 Expires 12/23/17. 10th-ranked golfer in the region. The Bengals missed out on the state tournament. Region frontrunners Skyline, Corner Canyon, Alta and Timpview got the nod, as all three schools ﬁnished in the top 10 of the tournament. Get An Extra $15 Off & Free Shipping On Your 1st Order! Call the number below and save an additional $15 plus get free shipping on your first prescription order with Canada Drug Center. Expires December 31, 2017. Offer is valid for prescription orders only and can not be used in conjunction with any other offers. Valid for new customers only. One time use per household. Use code 15FREE to receive this special offer. Call toll-free: 855-977-8477 Please note that we do not carry controlled substances and a valid prescription is required for all prescription medication orders. With purchase of any meal! Limit 1 per customer. Exp. 11/30/17. Professional Nails & Spa Pedicure Services Try our Chile Verde Burritos and Carnitas! Vegetarian & Gluten-Free Dishes available. We CaTer eVenTs oF all sizes. 1891 E Fort Union Blvd • 801-942-1333 CitY JourNal is a Free PubliCatioN made Possible bY our advertisers . Please sHoP loCal aNd let tHem KNow You saw tHem iN tHe CitY JourNal. ten-free onion rings, he clenched his jaw so tight his ears started bleeding. I heard him sobbing later in the bathroom. Changing my own diet is one thing. Changing my family’s traditional Thanksgiving favorites is another. Everything about this holiday is a freakin’ gluten fest. You have dinner rolls, gravy, pie crust, carrot cake, Ritz crackers with spray cheese, and stufﬁng (which I don’t mind skipping because it’s a disgusting garbage of a food). I experimented with gluten-free pumpkin mufﬁns that had the consistency of ground up snails. Even my dog wouldn’t eat them. Well, he ate them because he’s a Lab and he eats everything; but he whined the whole time. Researching gluten-free Thanksgiving Day recipes, I found a plethora of tasteless fare. Brussels sprouts in mustard sauce, quinoa stufﬁng with zucchini and cranberries, and a wheat-free, egg-free, dairy-free, taste-free pumpkin pie headlined my options. I tried making the organic, gluten-free, high-protein breadsticks. Yeah, they’re basically jerky. And what do you call gluten-free brownies? Mud. Why is gluten only found in foods that are delicious, like wafﬂes and cinnamon rolls? It would be so much easier to avoid gluten if it was just in cottage cheese, foie gras or earthworms. At least I live in a time where gluten-free products are available. Ten years ago, people going gluten-free could choose between kale chips or toasted particle board. Granted, most gluten-free products still taste like you’re chewing on a handful of toothpicks, but with new ﬂours available, like amaranth, chickpea and cricket . . . never mind. It’s still terrible.